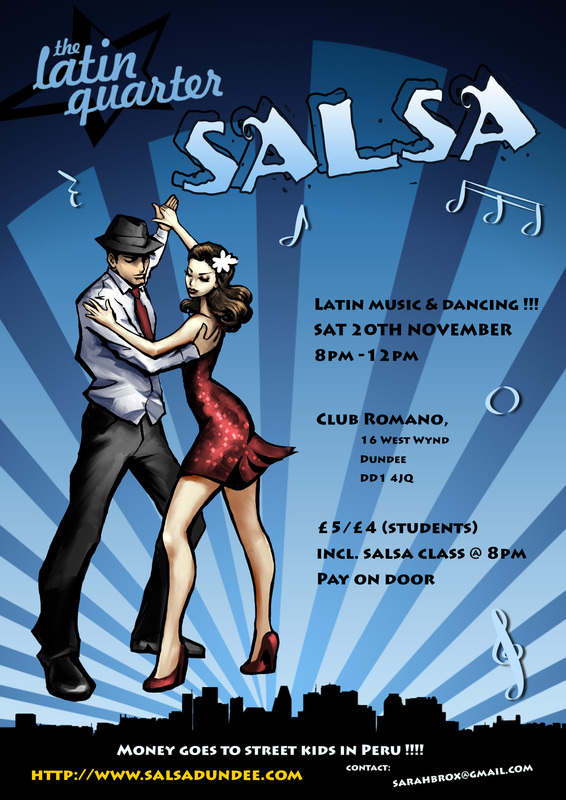 Salsa social night on Sat 20th Nov, 8pm till 12pm @ Club Romano, West Wynd, Dundee ( just off Perth Road, near Dilsee restaurant) If you’re new to Latin Quarters, its a latin night with music to dance to with a free beginners salsa class at 8pm. Pay on the door £5/ £4 (students), all money raised goes to help the Azul Wasi street children project in Peru. Please pass the word, there will also be a raffle on the evening too if anyone would like to donate a prize. Also Azul Wasi Christmas vouchers are on sale, a lovely gift for friends, family or via a collection at work, prices start at £5. See link for a list of vouchers, PROJECTAWgiftlist2. Email sarahbrox@gmail.com for more details of how to purchase these or info about Latin Quarter.